So, it is your first time going to Venice Italy. Of course, you don’t want to miss a thing. You want to hit all the highlights, that’s only natural. But will you find the time to do it all? Are there places and things that a first timer must do when visiting Venice? Well, to us, the answer is a resounding yes! Located in northeastern Italy, Venice is made up of 117 small islands separated by magical canals and connected by bridges. It sits between the Po and the Piave Rivers and in the Venetian Lagoon, where a portion of the city is listed as a World Heritage Site. Venice is one amazing architectural feast for the eyes after another, with each canal, bridge, and piazza more special than the one before. Just walking around is a treat in itself. Venice is divided into districts, each with its own charm. My favorite may be Dosoduro and my least Castello, but it’s a personal choice. We highly suggest you make sure to leave time to wander and find a perfect hidden coffee shop or restaurant to enjoy. Get off the main paths and do some shopping on the side streets. Venice has so much to offer. In fact, we stumbled upon the world famous modern art festival, la Biennale di Venezia just walking around and found the best pistachio scones and cream puffs on earth by chance! While Venice is very doable on your own, if you want to see it all and don’t have much time, we suggest hiring a local guide. Not only will you see sights you didn’t know you should see, but you can get tickets into sites with longer lines. Local guides can also get you tours before the crowds arrive or into special events. We have used True Italy when on our own for full and half day tours. 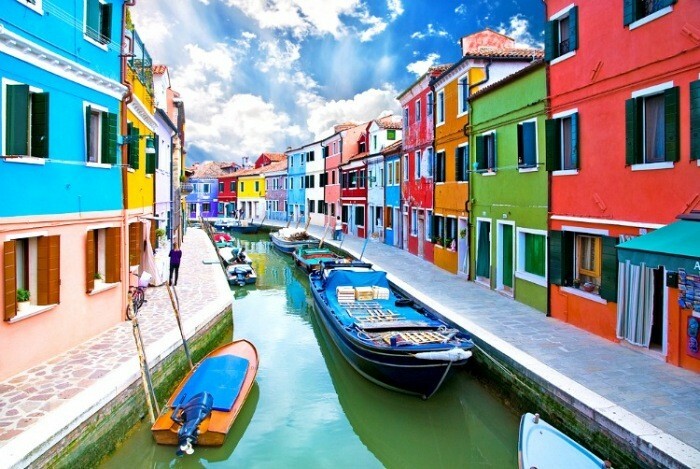 No matter what, leave time to see Murano and Burano. We put this first because people often say, “Oh, if there is time I will go there”. But they are not to be missed. You can easily get to Murano and Burano by water taxi or you can schedule a guide to take you there. Murano is know for it’s artisans in glass work. I will admit I have a few beautiful pieces purchased here. You can wander in and out of shops and studios and watch the pieces being made. Glass worker in action in Murano. Burano is known for the lace artists. Each handmade piece tells a story and make wonderful additions to your home or as a gift. We also love wandering the streets and looking at all the colorful houses. You may feel taking a gondola ride is so touristy or cheesy, but it is not. It is a must do! And a must do at night! Traveling through the canals is just amazing as it is truly the way the people get around. It’s also how farm fresh ingredients are delivered to the restaurants and how friends travel to visit each other. At night, the city lights up and gondola rides have a whole different feel. It is so moving to see the lights and amazing architecture. Be sure to leave time to also walk along the Grand Canal and take in all the sites. One of the most amazing squares anywhere we have traveled is found in the heart of Venice, Piazza San Marco. The square is made up of a series of stunning sites in themselves. You have both the famous brick bell tower, Campanile, as well as Torre dell’Orologio, a stunning enameled clock tower that strikes every hour. Then, three sides of the square are surrounded by stunning palaces. And on top of all that, there is Basillica di San Marco with its bronze horses and crown of Byzantine domes. The Doge’s Palace was the official residence of the elected officials of the former Venetian Republic. The Gothic-style palace is a must visit both for all that is in it and for the history. The Palace has functioned as a residence, the Venice Courts of Law, the civil administration, and prisons. Ponte di Rialto and the Grand Canal in Venice. The Gallery contains masterpieces that should not be missed if you are in Venice. There are pieces by Giorgione, Lotto, and so many more. Moved to its current location in 1807 by Napoleon, even if you are not a lover of Renaissance art this is a not miss for sure. No matter your level of shopping experience or love of shopping, a stroll down Le Mercerie is a must. It is a series of streets made up of the best of the best around the world and a true feast for those who love to shop. Whether a window shopper or looking for that special piece to take home, enjoy a long slow walk. Turn your shopping up a notch by heading to Salizada San Moisè to hit all the Italian designers. Truly a treat and if you only have time to shop in one area this is it! These may be part of the must-do guide to Venice, but there is so much more to see and do. Walking the streets, over the bridges, along the canals is truly unique. You will be doing a lot of oohing and aahing. Make sure you have time to get a little lost, discover pistachio scones and cream puffs you won’t find anyplace else, sit in a cafe in a square and watch the life around you, grab a piece of pizza late in the evening, enjoy LOTS of gelato, and find a local gem for dinner. Whether you have a day or three or seven, it will not be enough and you will leave planning your next trip! What’s on your Must-Do Guide to Venice Italy?